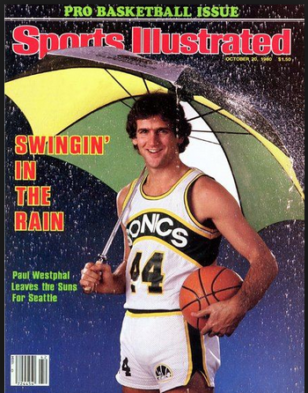 Paul Westphal was part of an infamous trade that brought him to Seattle as a player. He also coached the Sonics from 1998-2000. Now he’s in the Naismith Hall of Fame. MINNEAPOLIS — Paul Westphal has a trivia question he loves to ask. 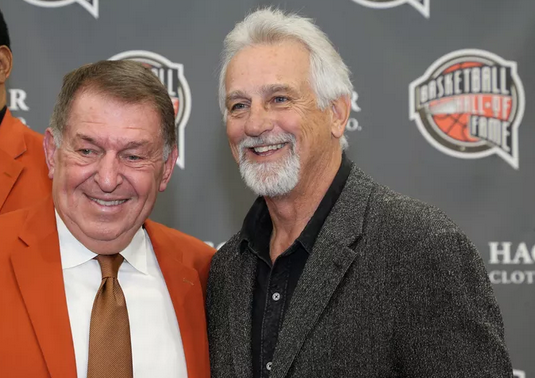 That’s because Westphal, a star NBA guard from 1972-84, was named to the Naismith Memorial Basketball Hall of Fame himself. Westphal played for the Sonics in 1980-81, struggling through an injury-riddled season in which he played just 36 games and averaged 16.7 points. He then signed as a free agent with the New York Knicks. Johnson went on to star with Larry Bird on the great Celtics teams of the 1980s. Westphal eventually returned to Seattle. He served as the Sonics’ head coach from 1998-2001, compiling a 77-71 record. Westphal’s best days were with the Suns from 1975-80, making four All-Star games. He still lives in Scottsdale. He also coached the Suns to the NBA Finals in 1993. But Westphal, 68, still has a soft spot for Seattle. It pains him that the city hasn’t had an NBA team since the Sonics left in 2008 for Oklahoma City. “I can’t even comprehend that they don’t have a team,’’ he said. “It’s one of the best basketball towns there’s ever been. It’s a disgrace between the politicians and whatever forces that were at work that allowed them to leave, and that is keeping them from having a team. Westphal, who averaged 15.6 points in his career, was one of two former Sonics named Saturday to the hall, joining center Jack Sikma, who played in Seattle from 1977-86. Others in the Class of 2019 were former NBA stars Sidney Moncrief, Bobby Jones, Vlade Divac, Carl Braun and Chuck Cooper, former NBA coach Bill Fitch, former women’s star Teresa Weatherspoon and contributor Al Attles. Two teams were named in Tennessee A&I of the 1950s and Wayland Baptist, a women’s powerhouse from the 1950s to the 1970s. Westphal came to Seattle after the Sonics lost in the NBA Finals in 1978, won the championship in 1979 and lost in the Western Conference finals in 1980. There was so much optimism when Westphal arrived that he was featured on the cover of Sports Illustrated. But the 1980-81 season didn’t go as planned, even though Westphal did make the All-Star Game. After a three-year run at the top of the league, the Sonics went 34-48, and Westphal sat out the final 21 games due to injury. He had another chance in Seattle as coach. The Sonics went 25-25 during the lockout season of 1998-99, then 45-37 in 1999-2000. Westphal was fired after a 6-9 start in 2000-01. My son got his autograph when Westphal was coaching at Grand Canyon State, and they were playing at the University of Puget Sound. He could not have been nicer. Glad to see Westphal make it in. Another player that should have gone in sooner. His gutsy move in game 5 of the 1976 Finals during the second overtime to call a time out even though the Suns didn’t have one resulted in a technical foul being called but also the Suns getting the ball back down by two. The Suns then inbound the ball to former Sonics draft choice Garfield Heard who successfully fired off the shot heard ‘round the world, forcing a third overtime. Even today few players could do the call that Westphal did. Always wanted to see him and Gus Williams play together though IMO DJ would have been a better partner. His Sonics coaching tenure all but ruined his NBA coaching career until the Kings took him in. Their chaotic environment ended his tenure, much like it had with George Karl. If anything his downfall here was similar to Bob Melvin’s with the M’s. Westy took over an aging Sonics team and the veterans remaining had trouble accepting him. Possibly his lack of success as a coach contributed to the delay in his induction? Hard to say. Never understood why the Sonics made this trade – breaking up a championship team by dealing DJ was akin to the Hawks picking up Harvin. Clearly firing offenses. Glad to see Westphal be chosen for entrance in to the Hall of Fame! He was a great player and it is well deserved. He first started receiving accolades early right out of high school when he was awarded co-player of the year in the City of Los Angeles. He shared the co-player honor with Lenzy Stuart who is still considered a LA playground legend to this day. Lenzy chose to come to Seattle U in 1968 and was highly touted as being the next Oscar Robinson. Lenzy led his freshman team to a one loss season with his team beating opponents by an average of 27 points. SU’s freshman coach Jack Shalow said he thought his team was the second best freshman team in the country led only by UCLA and Lew Alcindor. Their only loss was to Washington by 4 points who was led by Steve Hawes at Hec Ed. SU returned the favor and beat UW ( their only loss) at the Coliseum by 4. His teammates to this day say he was the greatest player they ever played with. Sadly, Lenzy’s career took a nose dive when he had knee surgery on both knees simultaneously.He was never the same and he became lost in obscurity. Seeing Paul having had such a successful career makes me wonder what might have been for Lenzy and how many other stories are out there about much heralded greats whose bright futures were dashed had they not succumbed to injury. It was disappointing to me, as well as many Sonics fans that Westphal was injured and played few quality minutes for the Sonics. Being in the same conference we were all well aware of his offensive and defensive skills, but trading DJ for Westphal? Smart move for the Suns, bad move for the Sonics! Westphal was a good player, DJ was a great player.